Come feel the love this season and enjoy special tastings of two things most people love – wine and chocolate. We will be celebrating Valentine’s Day with two weekends of Wine & Chocolate, February 9 & 10 and February 16 & 17 from 12-5 p.m.
For both weekends, we are collaborating with Pierre’s Chocolates of New Hope, PA, which features original old world recipes by original owner Swiss chocolatier combined with modern touch creating. Pierre’s sources rare South American varietals via direct trade with farmers creating artisanal small batch chocolates. We will pair their chocolate and wines from Terhune Orchards Vineyard and Winery. 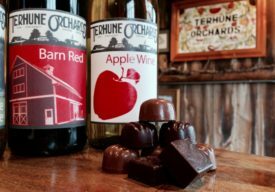 These special tasting weekends will include a tasting of five Terhune Orchards wines paired with a box of Pierre’s chocolates and a souvenir glass for $20. Enjoy our 14 wine varieties including red, white and fruit based wines by the glass or as a tasting flight. Terhune Orchards’ bakery will be also creating an assortment of homemade chocolate treats for the weekend. Have fun tasting them along with our wines. Catch up with friends by the fire pit outside the winery or inside the wine tasting room. Light fare available. After a fun afternoon of wine sampling, continue the love and take home a bottle of your favorite wine. Enjoy live music on Sundays as part of our Sunday Music Series. On Febuary 10th Michaela McClain and February 17th Kevin McGowan. Music is from 1-4pm in the wine barn. Celebrate your Valentine with a cherry pie. Each February, Terhune Orchards honors the memory of Presidents George Washington and Abraham Lincoln with our sale on cherry pie. Whether you’re celebrating Valentines’ Day, Lincoln’s Birthday or Washington’s Birthday, our freshly-baked cherry pies are $2 off the regular price in honor of these two great presidents who both had an All American, honest love for cherry trees and pies. Cherry Pie Sale runs from Feb. 8 until National Cherry Pie Day on Feb. 20. The farm store is open Mon-Fri 9 a.m. – 6 p.m. and Sat. – Sun., 9 a.m. – 5 p.m. The winery is open Friday-Sunday 12:00 p.m. – 5 p.m.